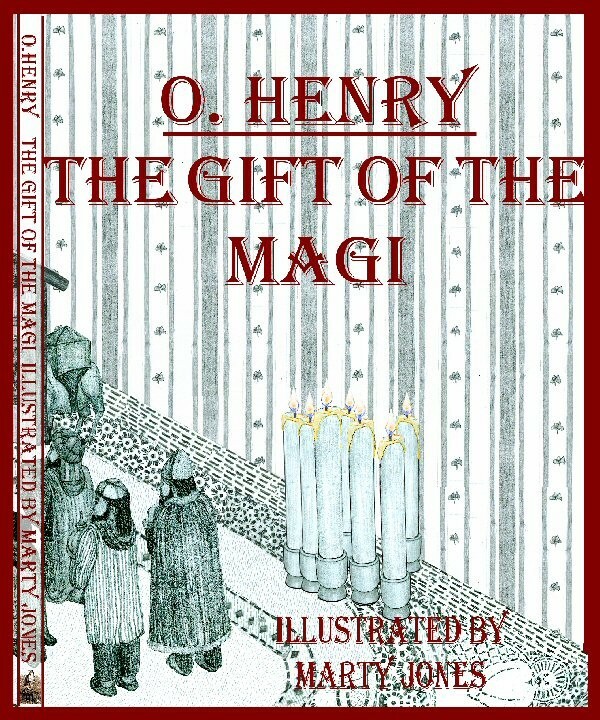 “The Gift of the Magi” is an illustrated short story originally written by O. Henry. 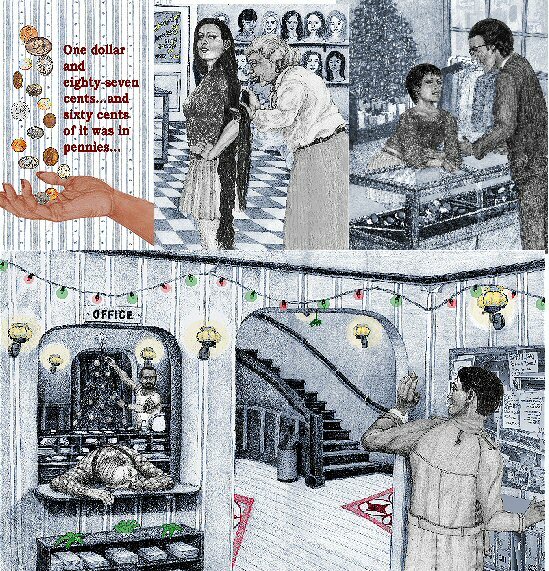 It tells the story of a young married couple named Jim and Della and how they deal with the challenge of buying secret Christmas gifts for each other when they have more love than money. I don't remember a time that I didn't draw; I began drawing "seriously" in High School and intended to become a Technical Illustrator. Lack of planning and foresight led me to a de… Show more. Send a message directly to Marty Jones. I don't remember a time that I didn't draw; I began drawing "seriously" in High School and intended to become a Technical Illustrator. Lack of planning and foresight led me to a degree in Architecture, instead of an education in Art. External distractions, such as "lack of work" led me to an eight-year career in construction; further distractions, such as "lack of work" led me to a career with the City of Portland as a Building Plans Examiner, from which I 'retired' with a medical layoff in 1998. But the dream never died... I've been a freelance commercial artist and designer for over 30 years; primarily working on commission for individuals as sort of a "professional hobby" until 1998. During my college years I exhibited my artwork in a number of non-juried shows, but found little time for "serious" illustration until 1988, when a ruptured appendix and a brush with death caused me to re-evaluate my goals and priorities. I realized that my future wasn't as predictable as it appeared; and that God has given me a talent He intended to be used for the benefit of others. I then decided it was time to get "serious" about my career as an illustrator. My body of work is fairly eclectic in its nature, and isn't specifically geared toward one type of illustration, however, all of my illustrations are realistically-styled. My preferred media are graphite, digital and colored pencil; I also use ink, watercolor, acrylics and airbrush as the need arises. Over the years I have created a large number of wildlife drawings, portraits, architectural and technical illustrations. I teach art classes for children on an irregular basis; I also do school visits. My first book jacket was published in the fall of 1999; my first children's book was published in 2000. My work has been published internationally in children's books, periodicals and on the Internet. I fell in love with illustration because of Norman Rockwell, NC Wyeth, Howard Pyle and the ‘golden years of illustration’. Growing up with illustrated classics, book jackets that weren’t photographs, illustrations created without photoshop. A brush with death in 1988 provided the impetus to start illustrating, while I was working for the City of Portland. I’m in the process of finishing on the second book I started, back in the early 90’s. The hope is to get it self-published next year. In the decades it’s been sitting, the story has gone into the public domain, so it has a chance of being something more than a promotional project. The why: being a story teller. I write well, but I’ve never wanted to be a writer. I want to bring words to life, but more, I want to bring heroism to life. Heroism is more than words, it’s deeds, and sometimes deeds are best told by being seen. One of my dreams is that illustrated classics will again come back into vogue, and that they won’t entirely be photoshopped photographs. I believe that the vast majority of us neglect to enjoy and experience the small moments of life, which often contain the greatest meanings for all of us. In general, if there is a "message" to be found in my work, it is primarily because that message is already present in the viewer, and I have had the experience of presenting it to the viewer.